Chronic obstructive pulmonary disease (COPD) refers to chronic lung disorders that result in blocked air flow in the lungs. The two main COPD disorders are emphysema and chronic bronchitis, the most common causes of respiratory failure. 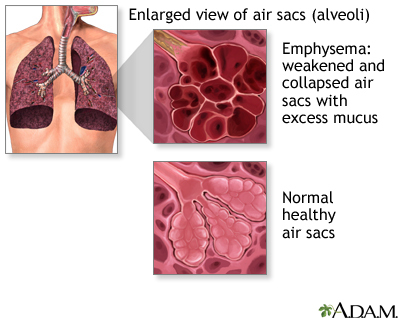 Emphysema occurs when the walls between the lung's air sacs become weakened and collapse. Damage from COPD is usually permanent and irreversible.